of Bubble and Sweet. 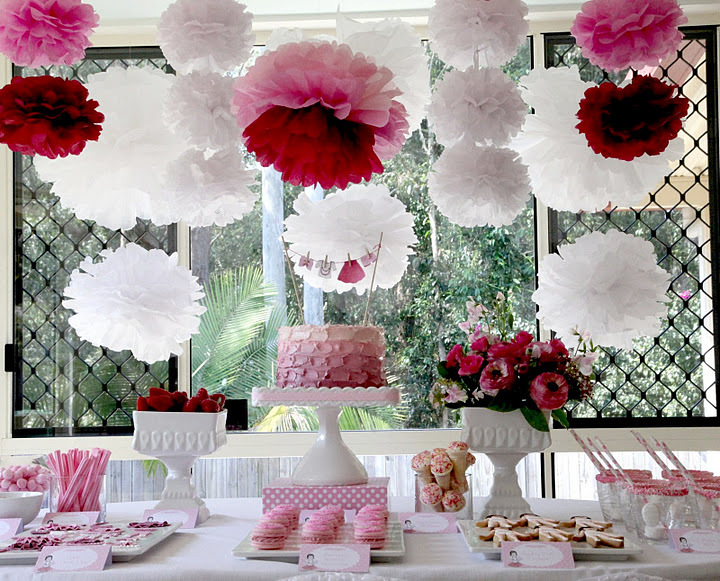 What an adorable party theme, don't you think?! 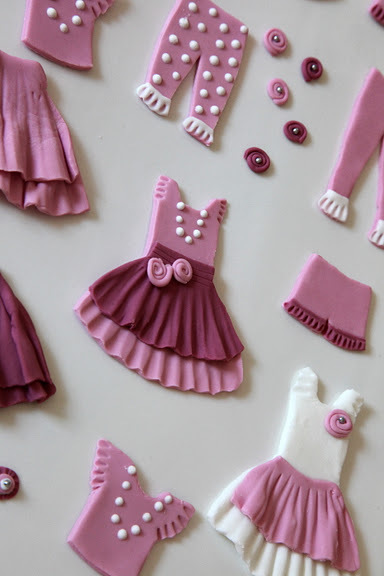 The children played paper dolls with COOKIES, dressing them with fondant clothing!! Oh. My. Goodness. It doesn't get much cuter than this. Such a lovely party. 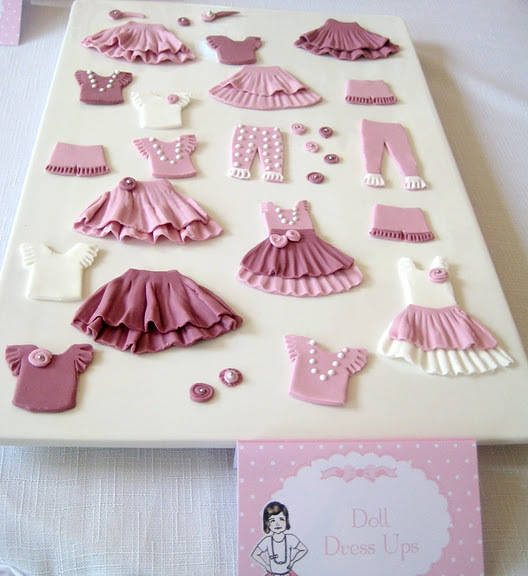 Here is what Linda said about the party- "For my daughter's 5th birthday party we had a Paper Doll theme. 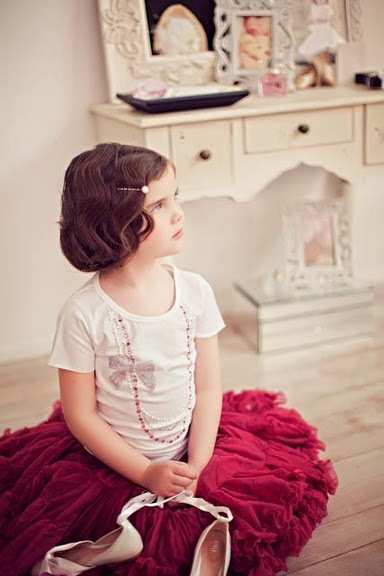 It was inspired by a picture of my daughter by Naomi V Photography for Princess Ratbag modeling a pettiskirt. The stylist pinned up her long hair and she looked like a little vintage doll. 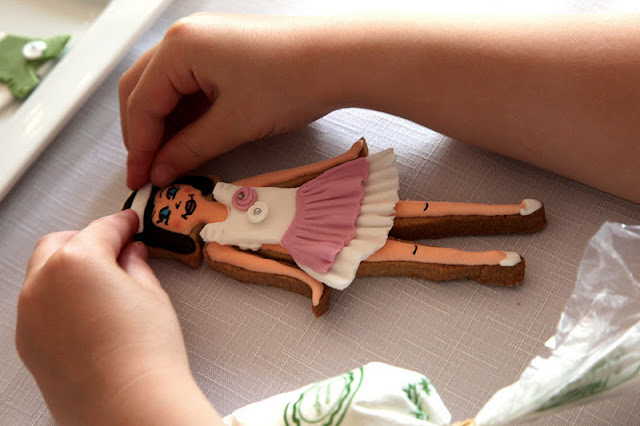 I made cookies to look like my daughter and fondant clothes that the kids REALLY dressed up using royal icing to adhere the edible fondant clothes to the sugar cookie doll. I have already posted this activity from the party on my site here. 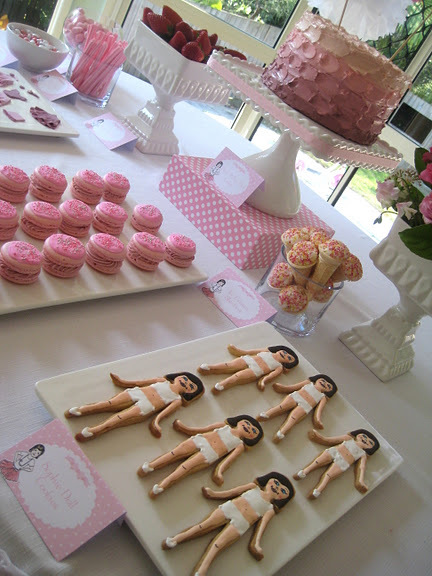 I also used the paper doll clothes to make a DIY bunting garland to top the buttercream pink ombre cake. Inside the cake was strawberry with white chocolate mud cake polka dots. A tutorial on how I made the ombre cake is available on my blog here. 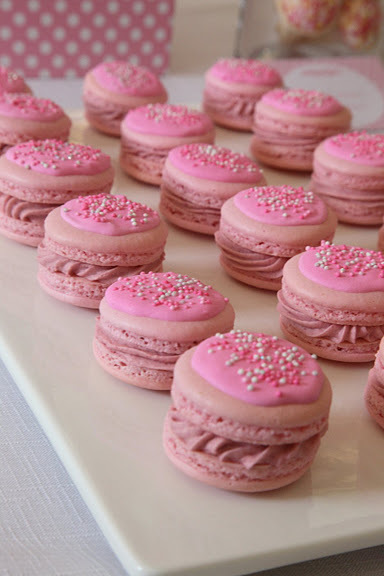 We also had princess sprinkle macarons and polka dot milk. I tried to come up with fun names for the party treats to work in with the theme. Instead of wrapping up layers of paper for pass the parcel, I popped a gifts into brown paper bags. I wrote a task for each child to perform onto the front of the bag. When the music stopped the child reached into the basket pulled out a bag and had to perform the task to get the gift, they were age appropriate tasks like singing a song or doing the hokey pokey, the kids thought it was lots of fun." 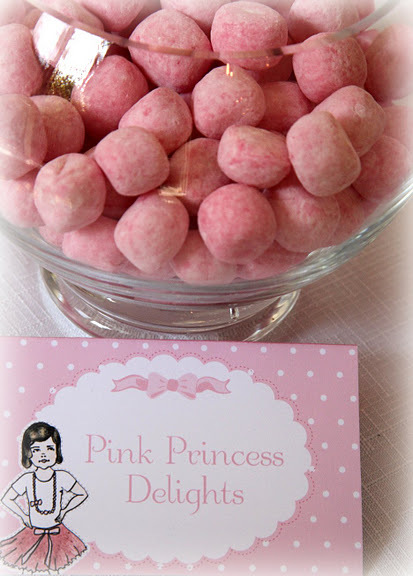 The party sweets were made by Bubble and Sweet. Party invitations, thank you cards and dessert labels by Polkadot Prints. Tissue Pom Poms by Ah Tissue. 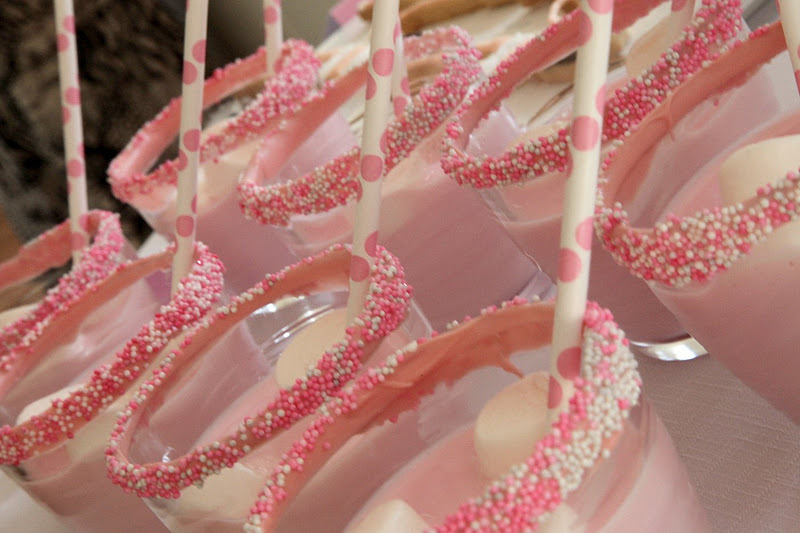 Cake Stands, polka dot straws and strawberry bon bons by Sharnel Dollar Designs. Photo Inspiration by Naomi V Photography. Flowers from Perrotts florist Brisbane. Love this party! Great job! i love this party! and my little princess! she loves pink!!!! I love this party, esp. 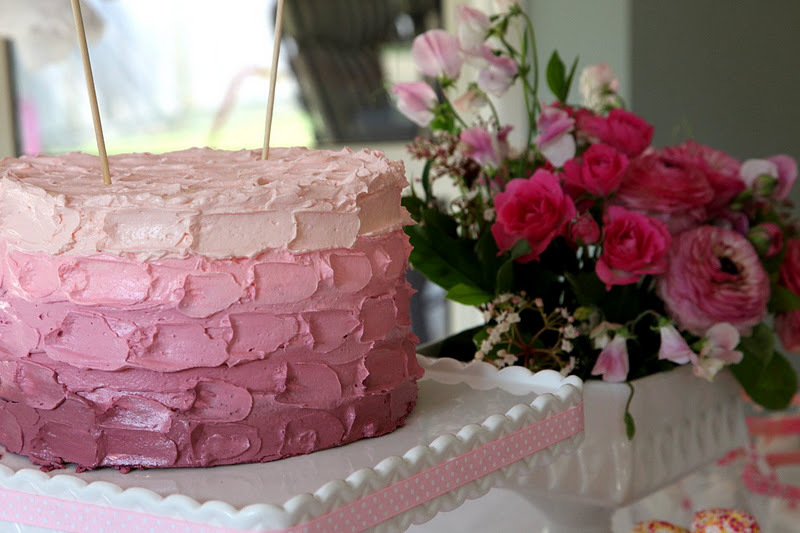 the cake with different hues of pink and that little girl is just so lovely!!! This is such a fabulous idea. I want to play too !! !